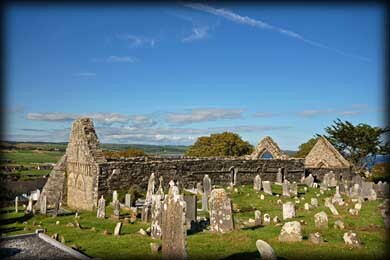 One of the earliest ecclesiastical sites in Ireland was founded in Ardmore by Saint Declan, a pre-Patrician Saint in the 5th century. At the site are the later remains of an ecclesiastical enclosure. Inside the enclosure are the remains of Saint Declans Oratory, the 'Cathedral' shown above, a 12th century round tower and two ogham stones. 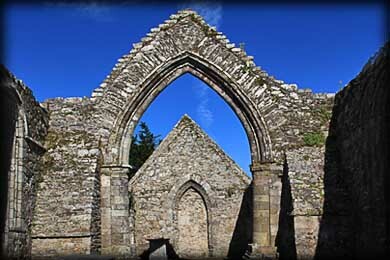 The Cathedral, which consists of a nave and chancel, was built by Moelettrim O Duibh Rathra sometime during the 12th century and probably in a number of phases. It is suggested that the church incorporates parts of an earlier church in the lower parts of the building. The main feature of this Cathedral is the arcading on the west face. The arcading consists a row of thirteen panels of which nine still contain Romanesque figure sculpture (see top image). Below these panels are two lunettes also containing figure sculpture. Some of the iconography of the panels are easily indentified. 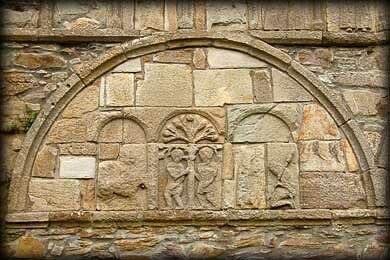 Shown right is the lunette on the north side of the west face featuring Adam and Eve. The lunette above features the adoration of the magi with the Judgement of Solomon above it. 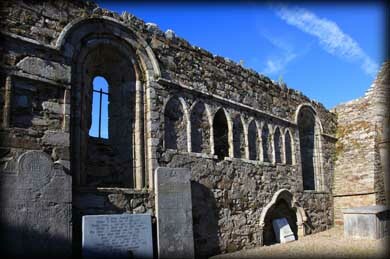 The building includes many phases of ecclesiastial architecture from almost cyclopean, through to Hiberno-Romanesque and Transitional. Another feature of the church is the transitional pointed chancel arch. LUGUDECCAS MAQI (...MU)COI NETA SEGAMONAS and DOLATI BIGA ISGOB. Situated: Quite easy to find this one - from the centre of Ardmore head south uphill to the round tower that dominates the skyline. Discovery Map 82: X 1882 7743. Last visit July 2011.